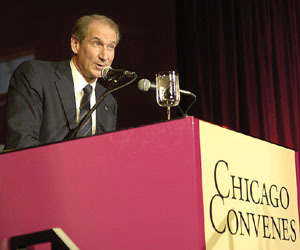 James Crown, Chairman of the University Board of Trustees, addresses guests at Chicago Convenes on Friday, May 6. Crown and his family are founding members of the Trustee Scholarship Challenge fund, as are University Trustees Andrew Alper, Robert Halperin, Edgar Jannotta and Peter May. Together they have committed $17 million toward the new challenge scholarships in the College. The Chicago Initiative took another important step forward Friday, May 6, with the announcement of a Trustee Scholarship Challenge, which could generate as much as $50 million in endowment for new scholarships in the College. President Randel announced that the founding members of the challenge fund include Chairman of the Board of Trustees James Crown and his family, and four University Trustees, Peter May, Andrew Alper, Jannotta and Robert Halperin. Together they have committed $17 million that provides $1 dollar for every $2 a donor gives to create the new scholarships. The crowd also applauded warmly as Jannotta announced the current total receipts for the $2 billion campaign. “I’m thrilled to announce that we have received $1,250,149,216.33. We count every penny,” he joked as the crowd responded. Randel praised the guests attending Chicago Convenes. “You are our most loyal and greatest friends,” he said. Randel also pointed to some recent achievements at the University, which were highlighted in a video shown at the beginning of the program. “You saw North Kenwood/Oakland Charter School, where, thanks to research at the University, some of the most disadvantaged students in the city are learning to read and write,” proving that with the right instruction, all students can succeed, he noted. Other accomplishments shown in the video included the Gerald Ratner Athletics Center, the new University of Chicago Comer Children’s Hospital and the Center for Integrative Science, currently under construction. All of these buildings have been made possible by the Chicago Initiative. At the program, Jannotta announced that he will step down Friday, July 1, as chairman of the campaign and will turn the responsibility over to Alper, who is Vice-Chairman of the Board of Trustees. “He’s the right guy for the job,” Jannotta said. Members of the University faculty taught an array of intellectually rich offerings that included a session on warrior films in China and Japan; the role of religion in the 2004 presidential campaign; College classes on Emperor Constantine and the Battle at the Milvian Bridge; pattern, repetition and variation; nature and nurture from a variety of perspectives; Einstein, race and community; civil liberties in wartime; and sports, society and science. Some guests opted to tour the Comer Children’s Hospital. After nourishing their brains, attendees of the event moved on to an elegant reception held beneath the glass arches of the Rothman Winter Garden at the Chicago Graduate School of Business Hyde Park Center, before walking over to Rockefeller Memorial Chapel to pass under white awnings and enter its elaborately transformed space, which was made into a dining hall for 500 guests. At the dinner, the guests celebrated the new inductees of the Harper Society Founders Circle, consisting of alumni, friends, corporations and foundations that have made lifetime contributions of $1 million or more to the University. 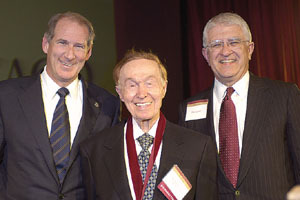 The event was capped with the presentation of the University of Chicago Medal, which went this year to Gerald Ratner (Ph.B.,’35, J.D.,’37) for “distinguished service of the highest order.” “Receiving this medal means, perhaps, that I’ve made a difference in the world and that my life has been worthwhile,” Ratner said.